When businesses exhibit at trade shows and events, generating new business leads is often their top priority. But some businesses spend several days with a large booth space at a busy trade show, only to return back to the office with a simple list of contact details – not leads. What’s the difference between lead capture and contact collection? Put simply, the difference between collecting a lead and a contact from a trade show is in the quality of information you capture about them. If all you’re getting is a name and an email address, that’s a contact. But if you’re getting that contact information, plus additional qualifying information such as what product had a demo of, or which features they’re particularly interested in, then they’re a lead. Most companies talk about ‘capturing leads’ when they exhibit at trade shows or other events, when in fact many of them just collect contact details. Why? For the most part, it’s down to the methods used to collect people’s details when you meet them at your stand. How do you collect leads at events? There are lots of different methods and tools that businesses use to collect leads at events. Different tools allow you to collect different information, so often your choice of lead capture tool controls whether you collect a contact or a lead, every time you speak to someone. While using a clipboard and a stack of paper forms isn’t the most modern or innovative data collection method, it does enable businesses to capture leads, not just contacts. Businesses can design their paper forms to ensure they collect all the information they need, to understand what a potential customer is interested in, when they speak at their event stand. ‘Lead retrieval‘ is a bit of a misnomer here. The quality of data you get back after using a badge scanner depends largely on the information collected by the event organiser during registration. Often we speak with businesses who regularly hire badge scanners when they exhibit at trade shows, and are fed up with the poor quality of data they get back – most commonly a long spreadsheet with nothing more than a list of contact details. On their own, business cards just provide you with someone’s contact details. However, some exhibitors use business cards alongside paper forms, as a quick way to get someone’s contact details, leaving them free to focus on noting down the more in-depth qualifying information. Lead capture apps allow you to collect people’s contact details in several ways: scanning event badges, scanning business cards, and manual data entry. While the exact functionality varies between apps, they enable you to ask for additional qualifying information – so you really are capturing a lead, not just a contact. Some even allow you to send leads directly to your CRM software, which makes post-event follow-up quicker and easier for your reps. If capturing new business leads is truly your company’s top priority when exhibiting, it’s worth reviewing your event lead capture process before your next trade show. Take a look over the data you collected at the last few shows you exhibited at: were you really collecting leads, or did you just come away with long lists of contact details? 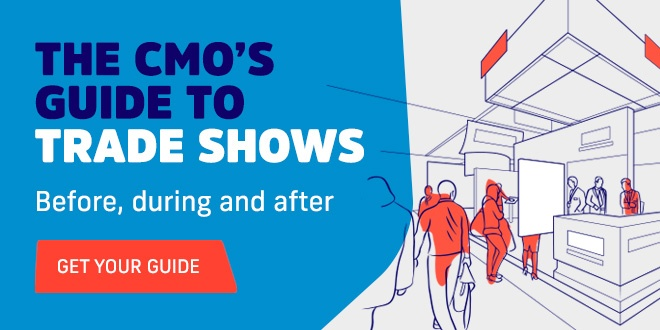 Learn more about improving lead capture processes for trade shows and events: get the guide.